►Ok, so this may or may not have gone so well... Carter tries to recreate Phil Mickelson's famous 2nd shot from the pines on the 13th hole of Augusta in the 2010 Masters!! 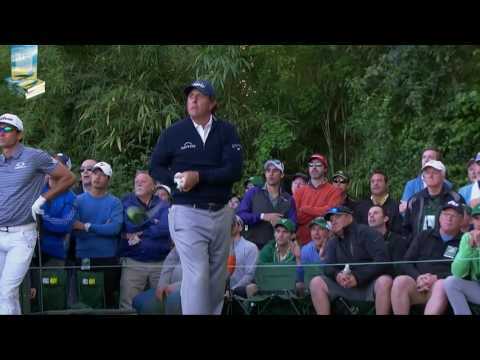 ►Ok, so this may or may not have gone so well… Carter tries to recreate Phil Mickelson’s famous 2nd shot from the pines on the 13th hole of Augusta in the 2010 Masters!! Tiger Woods - masters shot on 16th hole 2005 in Augusta. Great vlog Andy; loved it! Wouldn't mind seeing you recreating other great shots from the Majors. One small point, as much as I love The Masters, The Open is still tops. Should have tried it left handed! LOL! Gotta disagree with you The Open is the best. I will say this Carter…Phil had the advantage here because he was in the midst of the battle and had everything going forward for him already including intensity….focus and adrenaline…you did not have that going for you.